One of the most sought after species, autumn to winter flowering, and with very attractive large flowers, Cymbidium tracyanum also has sweetly fragrant flowers. 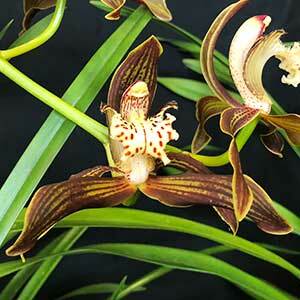 The species itself is readily available, however it is the hybrids are also becoming more popular. 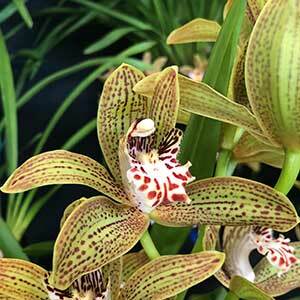 This is a cymbidium that is best grown as a specimen plant. The magnificent flowers deserve this amount of attention. Both sepals and petals are slightly twisted and both are spotted and striped. Being an epiphytic orchid, this is a species that requires excellent drainage. It is also from warmer climates, mainly Burma through to southern China. It grows naturally in strong filtered light and thrive on warm moist summer conditions. in cultivation this is an orchid that is mainly grown in containers it can also be grown in other media, including hanging and slatted baskets. Best grown in a warm climate, although an indoor position on an enclosed patio is suitable. In cooler climates especially during the winter months watering is usually reduced.